Soil anchors are placed in the ground outside the home. Steel rods attached to soil anchors extend through the foundation wall and wall plates. Wall plates distribute clamping pressure. Tightening nuts on the threaded ends of the rods stabilizes the wall for a permanent solution. When space issues prohibit wall anchor installation, we recommend installing the PowerBrace™ Wall System or CarbonArmor® Wall Reinforcing System. We can straighten your bowing, buckling foundation walls! Our solutions are warrantied, and most can be done in a day! Call us for a free foundation wall repair quote today! We serve Victoria, San Antonio, Laredo, and many nearby areas in Texas. How does moisture affect clay soils? Gutters and downspouts can also contribute significantly to foundation problems by allowing large volumes of water to collect in the soil around your structure. At Foundation Supportworks, Inc., we take pride in leaving each job clean, neat, and free of damage to existing landscaping. As part of our cleanup process, we fill holes completely with dirt saved earlier and tamp filled areas to ensure that depressed areas will not be created as the soils settle over time. In some cases, a wall anchor system can't be used to repair a bowing wall because the yard outside the house isn't accessible. When we at Foundation Supportworks, Inc. encounter this kind of problem, we suggest that you install our PowerBrace™ Foundation Wall System or CarbonArmor® Wall Reinforcing System. Installation of a PowerBrace™ system can be conducted quickly in your home, with no disruption to your lawn, gardens, foliage, or other landscaping. Learn more about the PowerBrace™ System. Strips add strength. When epoxied to the foundation wall, strips of carbon fiber fabric provide reinforcement that’s 10 times stronger than steel. The CarbonArmor® system is an excellent way to solve cracking, bowing foundation wall problems. When soil pressure causes a foundation wall to bow inward and crack, one solution is to stabilize and strengthen the wall using CarbonArmor® bracing technology. The CarbonArmor® Wall Reinforcing System relies on the exceptional strength of carbon fiber fabric – 10 times stronger than steel. Concrete is strong in compression, enabling a foundation wall to withstand extreme downward pressure. But concrete is weak in tension. A foundation wall can’t stretch or bend in response to sideways soil pressure, so cracking and bowing problems sometimes develop. When installed against a foundation wall with special structural epoxy, CarbonArmor® fabric is exceptionally strong in tension. This reinforcement treatment enables a cracked or bowed foundation to withstand soil pressure without sustaining further damage. CarbonArmor® repairs can be made quickly and affordably, and this low-profile repair is easily hidden with a coat of paint. Learn more about the CarbonArmor® Wall Reinforcing System. This solution is extremely disruptive, expensive, and time consuming. What's worse, it's not really addressing the issue that caused the damage in the first place! Your foundation isn't the problem -- the soil is! When you're done building that brand new foundation, you can count on the soil to press just as hard on the new walls. This will cause them to be damaged -- just like it did to the ones that preceded them. Looking for foundation wall repair experts in Texas? At Foundation Supportworks, Inc., we're proud to provide warrantied solutions that will permanently solve issues with bowing, buckling foundation walls. We provide free, no-obligation foundation wall repair estimates to homeowners throughout our Texas service area. Each estimate is made in person, on site, and is presented in writing. 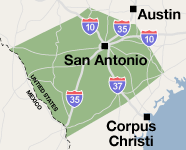 Our service area includes Laredo, Victoria, San Antonio, and nearby areas such as San Marcos, New Braunfels, Del Rio, Eagle Pass, Kerrville, Beeville, Seguin. Call or e-mail us today!